No, we're not reviewing a huge alligator that serves you coffee each morning (although imagine that! ), but we have been sampling some mighty fine cups of Joe recently. 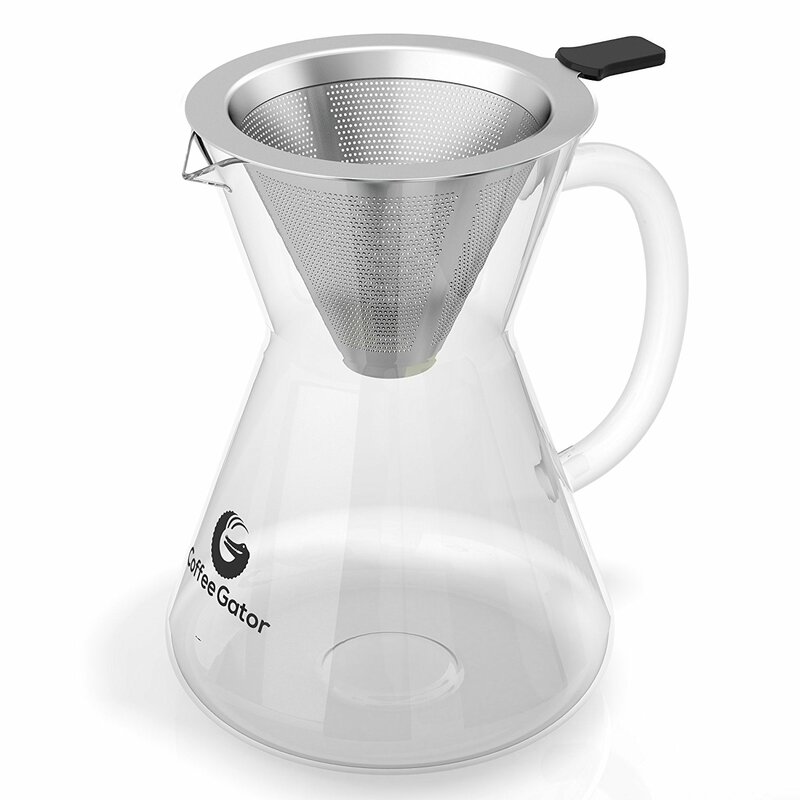 For a bespoke and considered coffee, we've been testing the Pour Over Coffee Maker and Kettle from Coffee Gator. You might be aware of our love of coffee, so we always jump at the chance to make a cup in a new way. When Coffee Gator got in touch and recommended both their Pour Over Coffee Maker and their stove-top Kettle, we were very excited; and that excitement was fell founded. In a nutshell, both of these products are low-tech coffee gadgets, not requiring electricity or coffee pods. 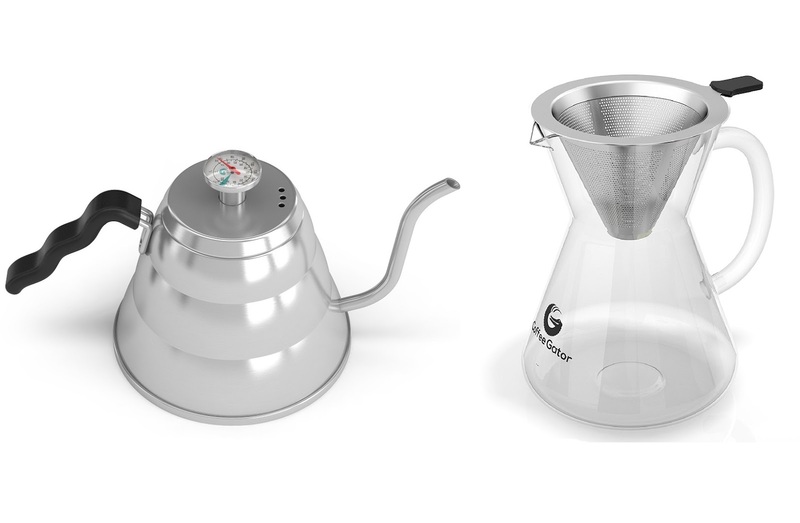 The Kettle is a stainless steel slow-pour kettle designed for placing on the stove, not for plugging in. The lid features a temperature gauge, which is the whole point of the kettle: pop it on the stove and actively select how hot you want the water to be to make your brew. Traditional electric kettles simply chuck the water up to boiling point and then stop. They may do that very quickly, but 100 degrees Celsius is actually too hot for coffee, resulting in a burnt grounds and sour flavour. The gauge on the Coffee Gator kettle highlights between 90 to 95 degrees; the ideal temperature for pour-over coffee. Once the water is to temperature you can use the long and narrow spout to slowly pour the water onto the Coffee Maker. 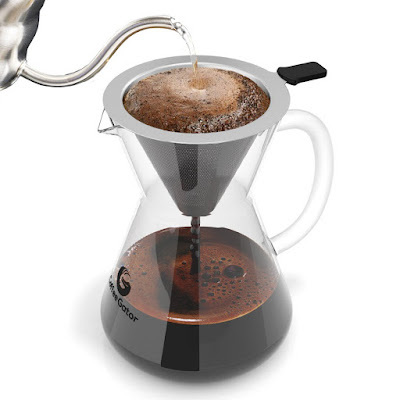 Made form curved and thin borosilicate glass, the Pour Over Coffee Maker features a handle and also a cup level indicator printed on the side. 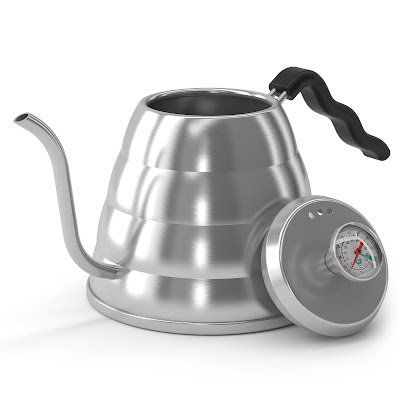 This is handy for measuring the amount of water to pour into the kettle beforehand. Included with the maker is a steel reusable filter that does not require paper to go into it. That means there is no continued expense, as all you have to do is give it a rinse or wash after ever use. It is large enough to hold the grounds for about three cups of coffee, and the filter section lets through the water, but not grounds. Which you'd always hope for. Pouring can take a minute or two, but coffee starts to drip through immediately. Once done, and with the filter removed, you then simply lift the carafe and pour your coffee. Done and done. The proof really is the tasting, and Coffee Gator's kit makes some damn fine beverages. 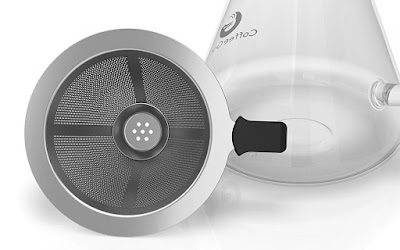 We typically drink only espresso and espresso-based drinks, but this pairing of gadgets might have steered us toward actual full cups or rich tasting coffee. It's smooth (depending on your grounds), full-flavoured, and very easy to both use and clean. If you're looking for a way to tailor your coffee perfectly, Coffee Gator is the way to go.